Steven D. Gorelick is a Partner at Garfunkel Wild, P.C., since October 2009. He is a member of the firm’s Apellate Litigation, Compliance and White Collar Defense, Employment Law, and Litigation and Arbitration practice groups. Mr. Gorelick has over 25 years of litigation and trial experience in New Jersey and New York, representing corporations, institutions and other businesses in various industries in complex litigation, class actions, investigations and audits, including in the areas of health care, employment, securities, real estate and general commercial litigation. Mr. Gorelick also counsels clients with respect to a range of employment issues, including non-compete and other restrictive covenants, trade secrets, employment contracts and wrongful termination and other employment practices claims. 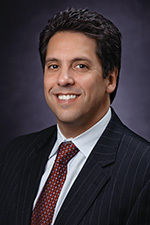 Mr. Gorelick's health care practice has included conducting internal investigations and negotiating complex settlements of claims with private plaintiffs and government agencies on behalf of hospitals and representing hospitals and other health care businesses in breach of contract, tort and other civil litigation. Mr. Gorelick has successfully defended numerous corporate and financial institutions in securities and financial litigation and class actions. He has obtained dismissals, summary judgment and successful outcomes after trial for clients on commercial, bankruptcy and real estate litigation, as well as numerous TROs and preliminary injunctions, while also successfully defending against actions seeking such relief. Mr. Gorelick is a graduate of Brown University and Georgetown University Law Center. Prior to attending law school, Mr. Gorelick was selected as a Fellow by the Coro Foundation in its leadership program in public affairs, held positions in New York City government, served as a mediator of community disputes in Brooklyn, NY and earned a master's degree in public policy analysis from the New School for Social Research. Before joining Garfunkel Wild, P.C. Mr. Gorelick was a litigation partner at Sills Cummis & Gross in Newark, NJ and Stern & Kilcullen, LLC in Roseland, NJ. He began his career in the litigation department of Schulte Roth & Zabel in Manhattan. Mr. Gorelick has served as a board member of the Jewish National Fund, Northeast Region since 2002 and on its National Legal Committee since 2006. New Jersey Law chapter of annual ABA Section of Litigation Survey of Class Action Law, for publication in Newburg on Class Actions, 2003 through 2006. "Safe Harbors for Forward Looking Statements: An Overview for the Practitioner," Practising Law Institute, Corporate Law and Practice Handbook Series, November 1997. "The Private Securities Litigation Reform Act of 1995," presented at Broker/Dealer Conference of the New York State Society of Certified Public Accountants, September 1996.